I am not sure why this post has been viewed so much lately, but thought maybe I should re-run it since people are finding it somewhere. This is from a couple years ago, but so relevant still. 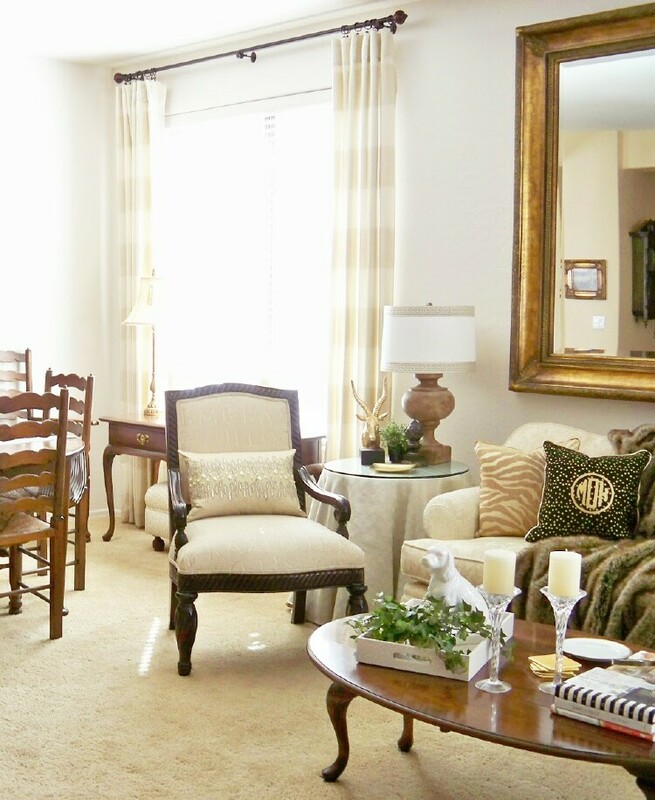 If you are trying to downsize or just lighten up, here are a few tips that might help you. I am always asked a lot of questions about my living room. I know I have shown it so many times that most of you feel like you live her, however there are some basic questions or comments that I hear over and over, so I thought I would answer them here. 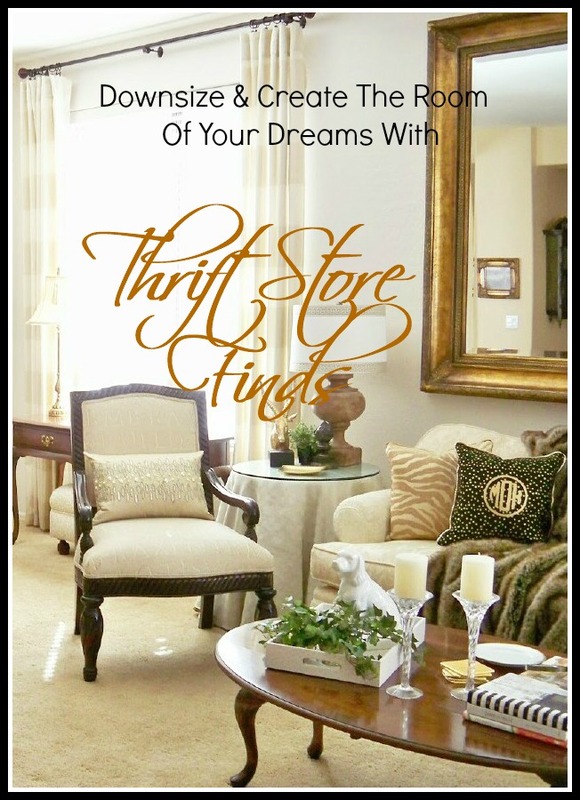 How to downsize and create your dream with Thrift Store finds. We sold the "big house" and downsized 8 10 years ago. Our home sold in 1 hour with a bidding war and for $25,000 over the asking price. The only condition was, could we move in 3 weeks. Now I hadn't even looked for a home yet, so I was under a ton of pressure. I needed something ready to move in. This was a builder basic "Spec Home". Not my true love, but the price was right. I didn't do much when we moved in but place what furniture I could into each room and call it good. I soon found out that downsizing was much harder than I had ever thought and I really missed the big house. Finally I decided to love where I am and make it work for us, so there have been many transitions over the last 8 10 years. 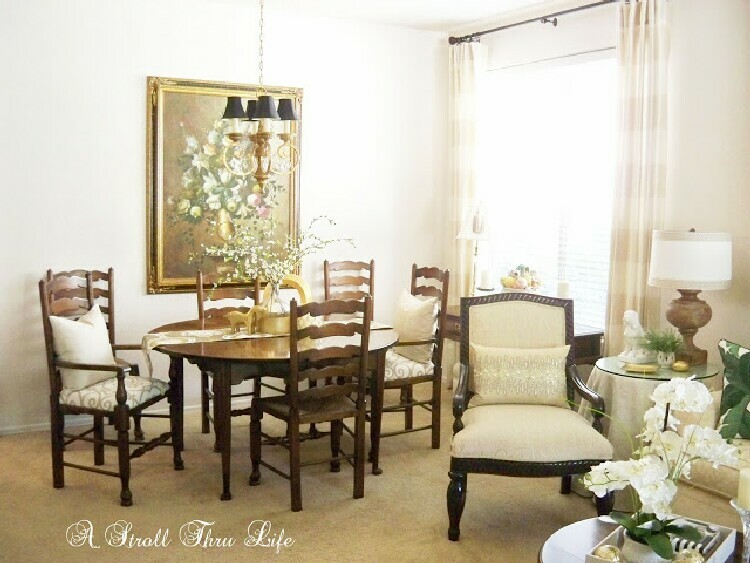 Here are a couple of pictures of our living and dining area in the previous home. Now don't laugh at the decor, this was the early 90's and I was heavy into my red and gold phase. 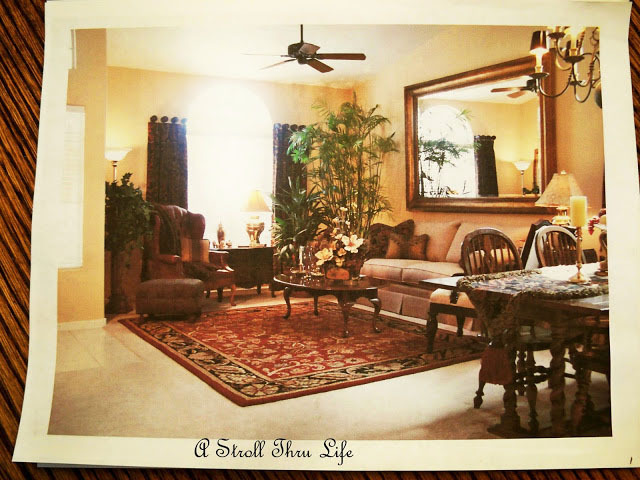 The living/dining area measured 25 x 40 and had two story vaulted ceilings, so lots of room and space. This is our current living/dining area. The space measure 17 x 21"8"
Since the front door opens directly into the room and becomes the walkway to the rest of the house, you are really down to about 14 ft. wide. That creates a really cozy space for two rooms, so the furniture had to be small in scale. The life saver of this room is the large mirror from our previous house, it almost becomes a mirrored wall and gives the illusion of twice the space. I found it at a design studio, it was so big no one wanted it, so I was able to get it for $229. That's a great price for a 4 x 8 ft. mirror. 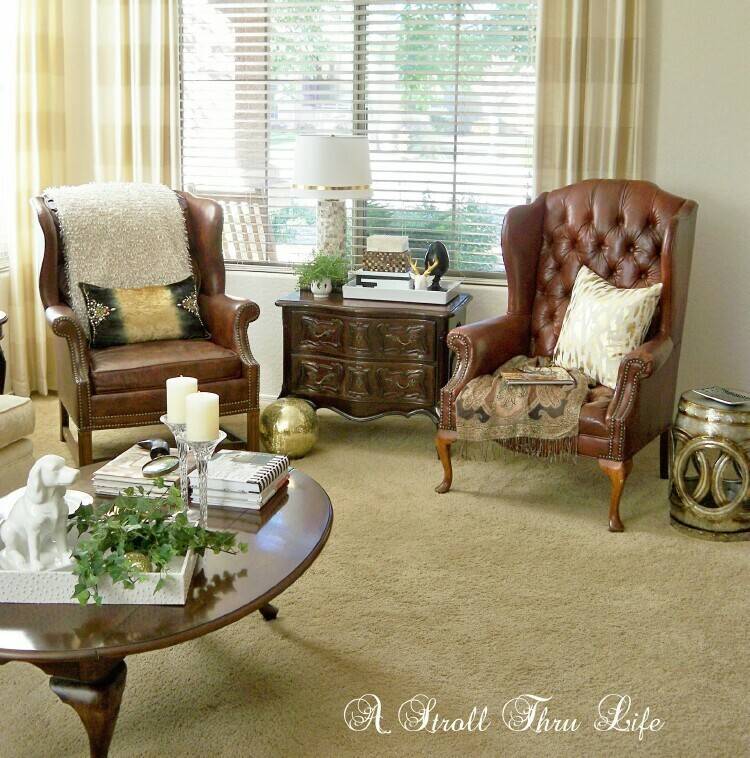 The first drapes that I used in the living room were gorgeous, I absolutely loved both fabrics and how the brown drapes looked, however, they definitely do grab your attention and make the walls appear closer. Sometimes it is best to keep the drapes neutral to match the walls. 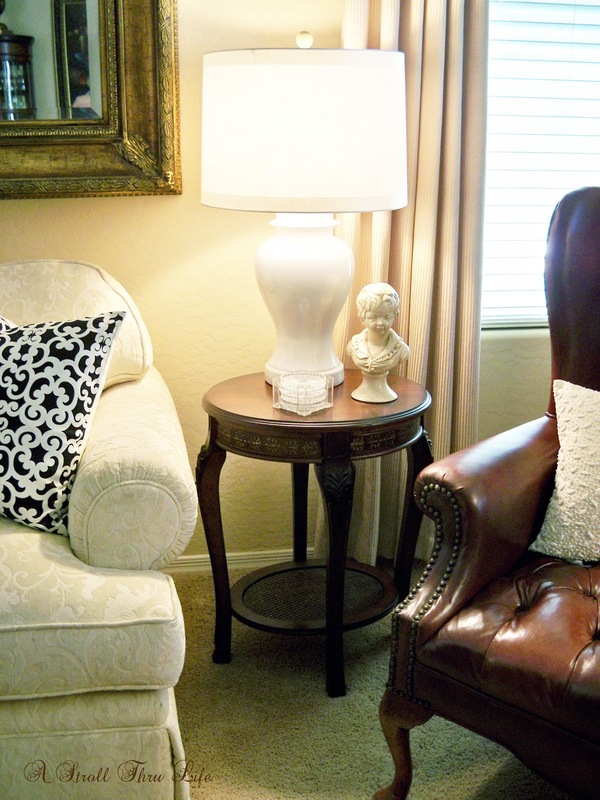 Using a really small end table on one side of the sofa and a small skirted table on the other also conserves space. This little table was a Goodwill find for $15. Since there are legs on the dining table and chairs, the skirted table brings color and something solid to this end of the sofa while it still blends into the wall since it has a neutral fabric. A table with legs would look crowded even though it would be more open. Just too many legs in one spot. Table rounds are really inexpensive and a Goodwill tablecloth looks amazing. On the dining end I chose a really large painting to draw attention to this end of the room. Again, one large painting has a clean uncluttered look. The simple bouquet in the painting allows you to feel as if you are looking beyond it. Smaller pictures or a gallery wall would close the space in. The painting was a "Starving Artist" piece for $79. The things I have learned during the last 8 10 years is you can use some of your larger furniture and art, just be careful to keep it to a minimum in any one room. Smaller scaled, open and airy pieces don't close a room in, but be careful of getting too leggy. Oversized stuffed furniture pieces and big boxy cabinet pieces are really hard to work around in a small space. One or two pieces can become a focal point and give a room character if the other pieces are more in scale with the room size, so pick and choose which pieces you want to have as a focal point. 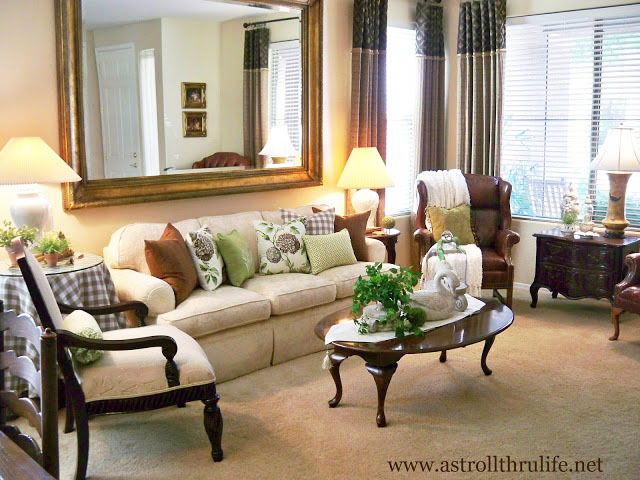 Every space needs to evolve, so keep making changes until you finally get the look you are seeking. I am not sure if I will ever have this room "done", but for now I love it. Leather Chairs - $100 ea. Love your blog Marty!! It is fun to go back and look at our previous floor plans...I can't wait to see if you move and what you do to your new house!! 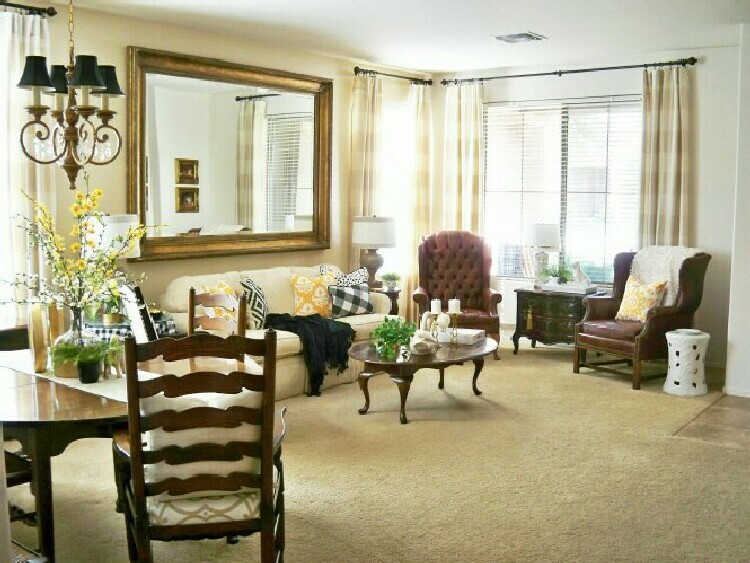 I love the before and after shots and you're absolutely right that a room has to evolve. Sometimes that involves the decorating phases we go through too! Back in the 80s I was all about Native American (part of my heritage), then that evolved into Western (a combination of NA and cowboy) when we bought our little 'ranch' in Texas. Speaking for myself, sometimes it isn't so much evolving as it is embracing a big change. About 10 years ago and probably because of a huge change in my life, my taste leapt into an English/French Country phase (also part of my heritage). But, like you, there are things I've collected during each phase that I can't bear to part with. Ahhh, will it ever end? I think not... Love your site, Marty! I love the ideas. I use to love buying new things, probably because I grew up poor and went to thrift stores to buy things. I change a few years ago and love going back to thrift stores buying things and remaking the things I have now. I am hoping to visit our Restore Store soon to find some goodies. Please share how you hung your mirror. I have several large, very heavy mirrors (wish I had yours!) and sheet rock walls. What's the secret besides finding the studs? Thank you in advance! We used really heavy twisted wire recommended by the hardware store that will hold tons of weight and then found two studs to nail really large picture hangers into and hook the wire over them. This has worked for 20 yrs in two houses. This mirror is really heavy, it takes 4 men to hold it up to get the wire on the hooks. Good luck with yours. You create a most beautiful home and a budget. 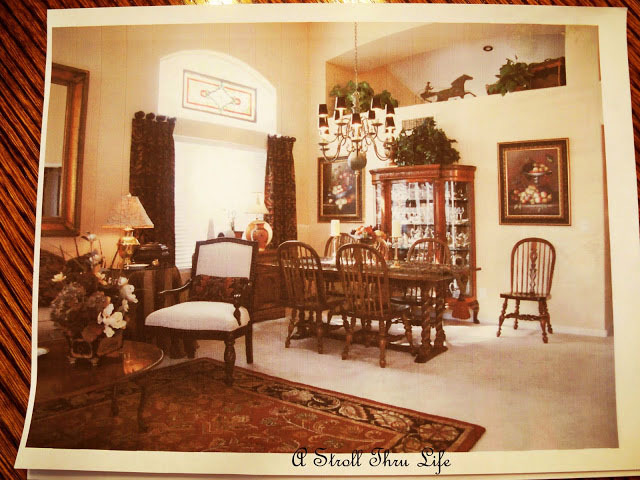 I have loved seeing your home evolve over the years....you are an inspiration! I don't remember ever seeing the post before. You are smart about how you approach things and wise with your money. I've never been a thrifter but around here they charge way too much for used furniture so I've never been inspired to buy that way. You always offer inspiring ideas and I like your common sense approach. I love your open concept and you have an amazing talent for making everything look perfect and space saving. Bravo! 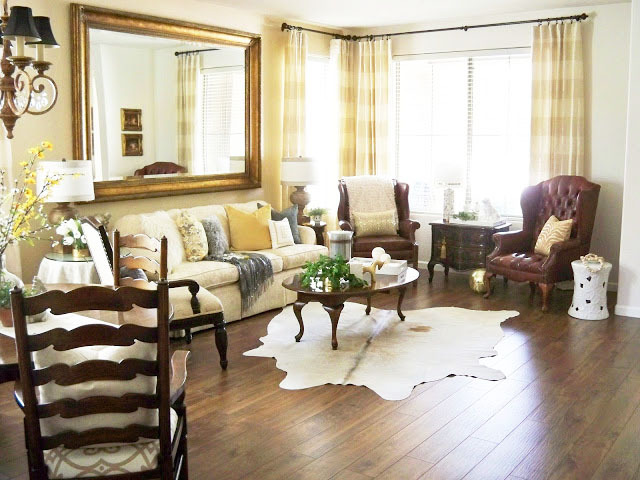 Your living room is looking beautiful! So many of our pieces are thrifted as well - such a great way to go! Marty- this post is full of such wise advice. My favorite is 'I decided to love where I am'. We are talking about moving to be nearer grandchildren and there are so many things to consider. Thank you for being so supportive of TOHOT. Love seeing the evolution of your rooms. Especially love the really nice furniture you found at fabulous prices. I used to work in a design studio/furniture store and new furniture can be horribly expensive and not always good quality.